As I continue my look back on my favorite moments from the Royal Rumble, I can't forget the very first event. It was only a 20 man battle royal, but the same premise was in place. And in 1988, the Royal Rumble was shown on free TV (USA carried it, so it was free if your parents had cable like mine) Guys like Harley Race, One Man Gang, Junkyard Dog, Ultimate Warrior, and the Hart Foundation all competed that year. Warrior was not yet the major player that he would later become, and I had him as my pick to win the Rumble. However, I was wrong. 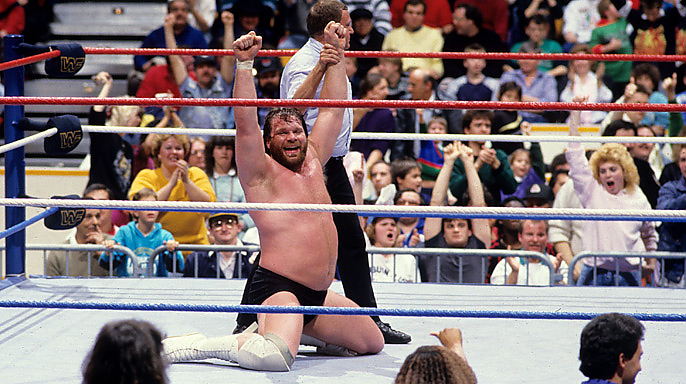 Hacksaw Jim Duggan overcame the 19 others to win the inaugural event. He overcame a two-on-one final three (Bravo and Gang were the other two) to pick up the victory. 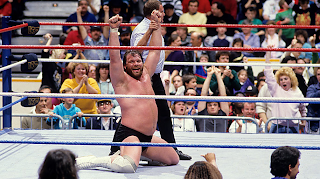 And since the WWF title was up for grabs in a tournament at Wrestlemania IV that year, Duggan technically got a shot at the belt since he was a member of the 14 man tourney. Now, as we prepare for the 25th anniversary, I'd like to see the WWE Hall of Famer get a spot in this year's event. We know he won't win, but it would be cool to see it as far as I'm concerned.